To have my memories preserved and something of museum quality to pass on to my children was well worth the time, effort and money invested. 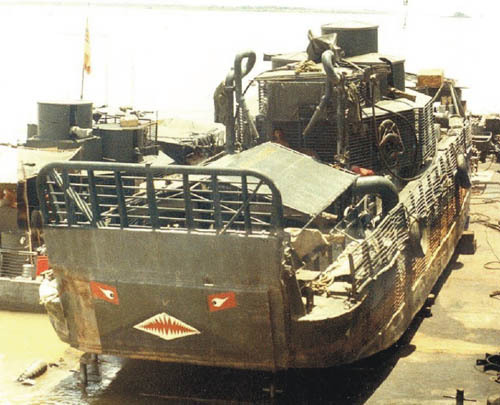 Tango-14 was commanded by BM-1 Ray F. Longaker Jr. from 10/1969 to 10/1970 and operated on the rivers south of Saigon and west to the Cambodian border together with Tango 32. “The boat was a big slow target and going against the current with a flat bow ramp the top speed was maybe 4 knots. When in a fire fight we were in the kill zone a long time and had to fight our way out. Long time meaning melting the barrels off the machine guns. We were in a number of fire fights and its a wonder why nothing – including us – was hit.” In the one year Tango-14 destroyed over 370 bunkers, spider-holes, trenches and booby traps, plus the capture of two significant enemy ammunition caches.